Nigerians have launched an #EndSARS campaign on Twitter, detailing atrocities committed by the Police Special Anti-Robbery Squad and called for its scrapping. The #EndSARS campaign, according to NAN as at 2pm (3rd of december, 2017) was number one on Twitter and it was immediately followed by over 400,000 tweets on the Police themselves. 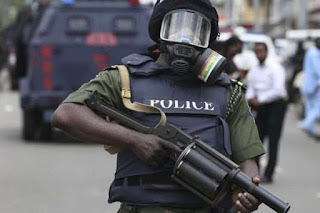 In posts after posts, Nigerians recounted horrible, harrowing encounters with SARS, the dreaded squad of the police, set up to fight banditry. Often, the men went off course to torment innocent Nigerians. People are not supposed to be afraid of the people that are supposed to be looking after us. A couple weeks ago, at almost midnight, my friends and I had a gun pointed at us for laughing. For laughing. #EndSARS #ActuallyTakeGunsAwayFromTriggerHappyPeopleWhoHideBehindTheUniform! Let me not even start getting angry again today. The same SARS that stopped my friend with his two friends on their way to Ilorin from Ogbomoso and planted “Indian Hemp” in his car. Each of their parents paid 50k. I support this #ENDSARS on their behalf. Here's another video of men of the SARS unit manhandling a citizen for refusing to enter their vehicle. The SARS officers here in Abuja are actually criminals legally carrying guns. The arbitrary harassment of young Nigerians by Police (who should be protecting them) has no place in a democratic society. The #EndSARS protest shows Nigerian youth are upset and the matter needs urgent attention.